After I-TEAM reports brought attention to conditions at Eureka Gardens, some improvements were made in 2016. 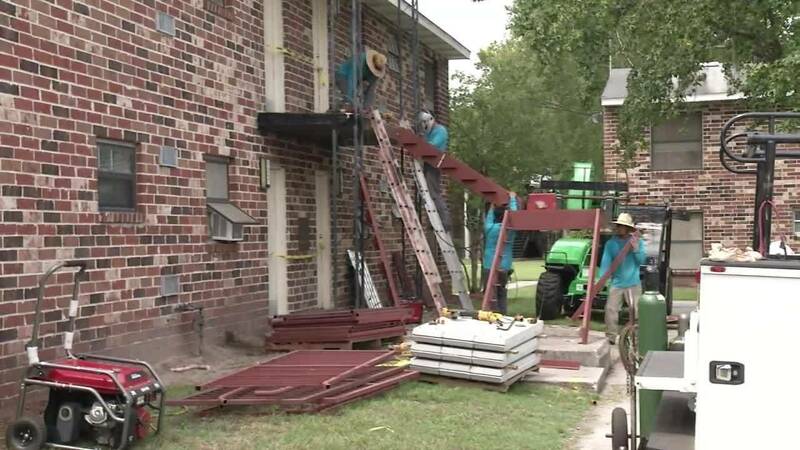 JACKSONVILLE, Fla. - Years after problems at the Eureka Gardens apartments in Jacksonville became the subject of federal inspections and a congressional hearing, residents are still complaining about gas leaks, sewage backups and mold. Global Ministries Foundation, which owned several subsidized housing complexes in Jacksonville and dozens more around the country, put this 400-unit Westside property up for sale two years ago after the I-TEAM exposed deplorable conditions, prompting a city code enforcement raid and re-inspection by federal housing regulators. A new buyer was found last year, but the transaction has not received the necessary government approvals. Dwan Wilson has lived in Eureka Gardens for more than a decade and said conditions have not improved. She said her gas has been cut off several times a month. "Gas service will shut off to the entire property due to major gas leaks," Wilson said. "The sewage backed up last week and it was overflowing." Wilson showed News4Jax letters from management dating back to March that warned residents about the gas leaks. "That's carbon monoxide. When you turn it on and it doesn't produce a flame, it causes a fume that's very harmful to breathe in," Wilson said. That's not her only issue. Wilson pointed to what she called black mold on the ceiling of her kitchen. She said it makes the air in her apartment unsafe to breathe. There are holes in her walls and more mold in her bathroom. Wilson said her two kids must take medications that help alleviate the complications they have breathing. Another resident, who didn't want to provide a name, worried the gas leaks could lead to something much worse. "I know that there are people out here who are smokers," the resident said. "What happens if it's not caught in time, if it's not fixed? That's just my concern." Residents now believe the apartments have deteriorated to the point that the complex needs to be torn down completely. "You're putting a Band-Aid on a gaping hole. You're not going to fix what needs to be fixed. The only way to fix these apartments, because they are very old, you have to tear them down and rebuild them," Wilson said. Millennia Housing Management, which contracted to buy the property last year, is already managing Eureka Gardens. A spokesperson said that until the deal is closed, all they can do is file work orders to address the complaints. When the sale closes, Millennia has plans to spend $17 million on renovations. Among the improvements will be new windows and doors; new furnaces and central air conditioning units; new plumbing, countertops and cabinets; new stairwells, porches and balcony configurations; and additional gas shutoff valves to enable them to fix a small gas leak without turning off gas to the entire complex. The community will also be renamed Valencia Way, with plans to beautify the grounds with new gardens, furniture, walking paths and playgrounds. In July, U.S. Sens. Bill Nelson and Marco Rubio urged the Department of Housing and Urban Development to resolve tenants' unanswered maintenance requests. "It is our hope that this ownership change will lead to direct results for the tenants of all properties in question," the senators wrote to HUD Secretary Ben Carson. "In the meantime, it is essential that all maintenance requests, especially those that pose a health and safety risk, are resolved immediately and that tenant surveys are conducted to ensure taxpayer dollars are being used as intended." While earlier this year projections were for the property to change hands over the summer, Millennia told News4Jax on Friday they hope to take ownership of the complex within three months. While that's more than a year and a half after the contract was signed, real estate experts said that's typical in the sale of Section 8 housing.